CONTEST CLOSED. WINNER TO BE ANNOUNCED THIS WEEK. A Back-to-School list is incomplete without a box of spanking-new Crayolas. These toys are timeless treasures and a launching pad for every tot&apos;s imagination. This year the 64 box turned 50 years old. 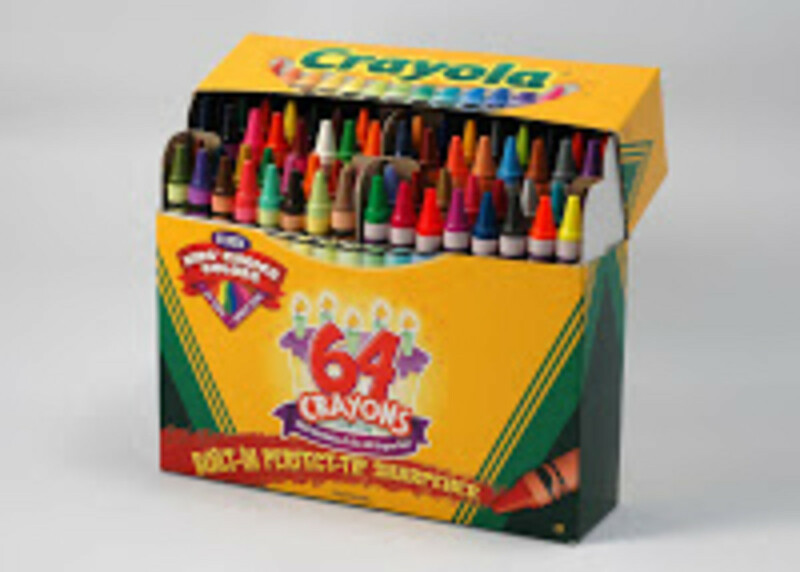 Since 1968, more than 200 million Crayola 64 boxes have been sold. The current incarnation ($6.99 at Toys R Us) inspired me to learn more. Today I spoke with Wendy Smolen (Editorial Director of Toy Wishes magazine) about Crayola. According to Wendy (an expert toy tester and mom of three), Crayola made their first child-friendly crayon in 1903. The founder&apos;s wife was a school teacher and a children&apos;s advocate. It took awhile for the 64 box to come about, but now this box is so iconic that in 1998 it was added to the Smithsonian museum. Q. Why have Crayolas have been around so long? The simplicity. It is open-ended and creative. There is no right or wrong way to use a crayon (except writing on the wall). Anyone can use a crayon. Like many classics, the simplicity of the Crayola crayon is what makes it last. Q. What are the top colors? A. In America the favorite color is blue--seven of the top ten colors are blue. Blue, cerulean, midnight blue, aquamarine, periwinkle, denim, blizzard blue. Q. Do colors ever get retired? Q. Any tips to get kids started? A. Scribbling is a natural instinct. With younger kids, you should look for crayons that are chunky. Your child may have scribbled all in orange. Don&apos;? ?t say, &apos;? ?You only like orange.&apos;? Instead ask him, "Why do you like orange?&apos;? Probe him to think beyond a yes and no answer. And buy lots of paper! Here&apos;s my tip--visit Crayola.com for FREE coloring pages and craft ideas! I&apos;m excited to announce, Crayola and Momtrends are teaming up to give away six boxes of the anniversary 64-pack this month. From now until August 31, enter by either commenting on this post or signing up for the Momtrends monthly newsletter. And a big shout out to the two winners from July: K. Newton from Coswell Michigan won the Trevi Twin and Alice from Kansas City won the Plush Pad!